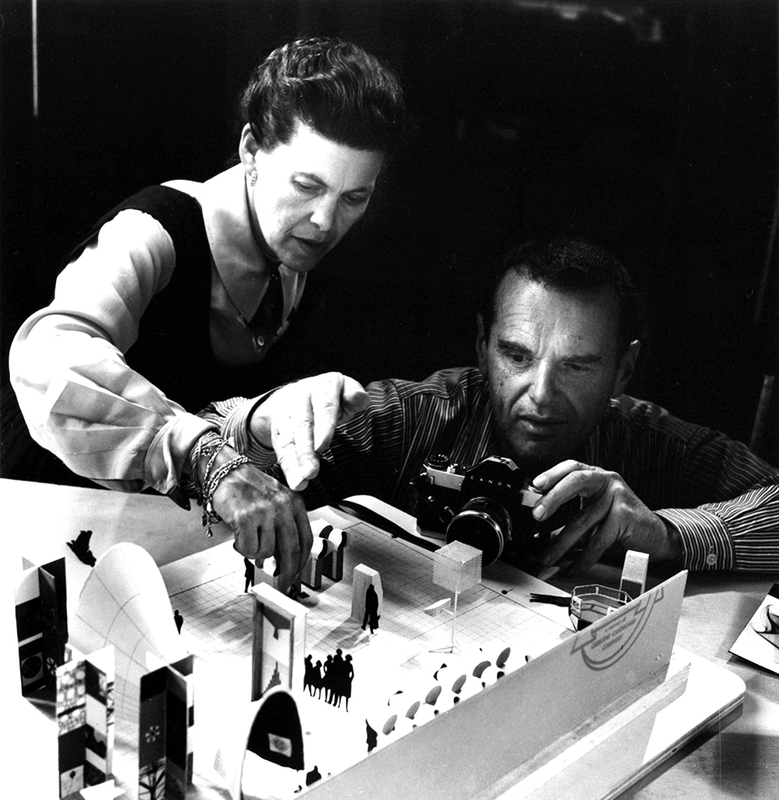 Husband and wife team Charles (1907-1978) and Ray (1912-1988) Eames played a major role in shaping the world of modern architecture and furniture, as well as working in industrial and graphic design, fine art, and film. Their aim was to utilize new materials and technology, so that everyday objects of high quality in both form and function could be produced at reasonable cost. No one worked harder than this pair; and no one took greater pleasure in their work. Charles, studued at Washington University in St. Louis MO. In 1938, he was invited to Cranbrook, founded by Eliel Saarinen, to head a new design department forming relationships with Florence Knoll and Eero Saarinen. In collaboration with Eero Saarinen, Charles began exploring the possibilities of new materials and techniques. The molded plywood furniture Eames and Saarinen designed for a 1940 competition organized by the Museum of Modern Art brought them considerable attention. Ray Kaiser, graduated from Bennett Women’s College in Millbrook, NY. She studied under German Abstract expressionist Hans Hoffman. Ray became part of a group of American Abstract Expressionists that included Lee Krasner, Jackson Pollock and Willem de Kooning. She continued her studies at Cranbrook where she met Charles. They married in 1941 and together moved to Los Angeles to focus on the mass-manufacture of low-cost molded plywood furniture; Ray became known for her stunning graphics and textiles. By 1951, they had produced commercially viable, mass production, low-cost furniture in plastic and metal as well as plywood. They were the first to do so. It was produced by the Herman Miller Company. Known as the ECW (Eames Chair Wood) model, this chair is still in production today. The Eameses eventually expanded the product line to include molded plywood dining chairs, tables, and storage units. Their experimental approach to materials continued through the subsequent decades with the use of molded fiberglass for a series of inexpensive shell chairs, a collapsible sofa, an upholstered, molded lounge chair, a range of aluminum-framed furniture and many other innovative designs. Their furniture designs were quickly adopted for both domestic and commercial use, and many of these extremely popular items are still in production today. Together they exerted a profound and lasting impact on twentieth-century furniture design in America and in the modernization of postwar America.